6 Unconventional Ways to Save Money on Your Wedding | Saving the Crumbs . 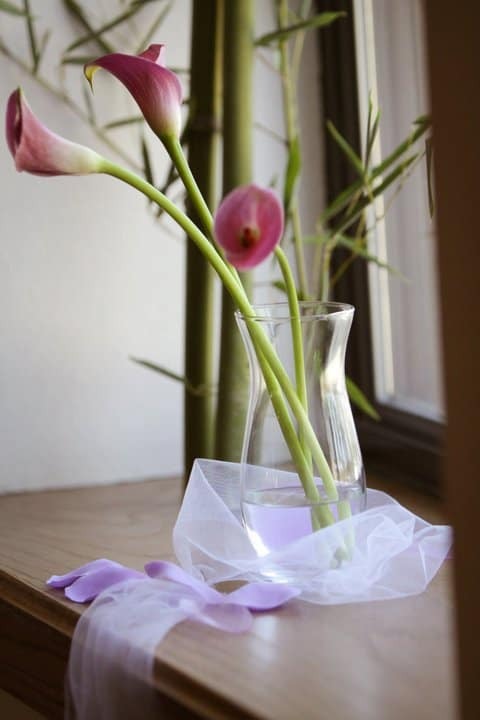 These artistic purplish-pink lilies with long elegant stems weren’t previously on my radar, but I soon realized what a graceful and sophisticated flower they were, even one lone flower stuck in a vase all by itself! At florists, they ran about $7/stem, but Sam’s Club* sold 150 mini calla lilies for $175, about $1.16/stem! We called to place our order for 150 lilies and the customer service rep encouraged us to have them arrive a couple days before the wedding in case any were damaged, as they guaranteed that any damaged ones would be replaced overnight free of charge. In the bustle before the wedding, the large flower box arrived….with a conspicuous dent where it looked like the top had been slightly crushed. Upon examination, we found that 25 flowers were slightly damaged but still fairly usable. However, we decided to call Sam’s Club and let them know what had happened. After explaining to them how the box had arrived and the number of flowers that were slightly damaged, the rep immediately stated that they would replace the WHOLE order! We were ecstatic! But then we realized we didn’t really need 300 flowers. 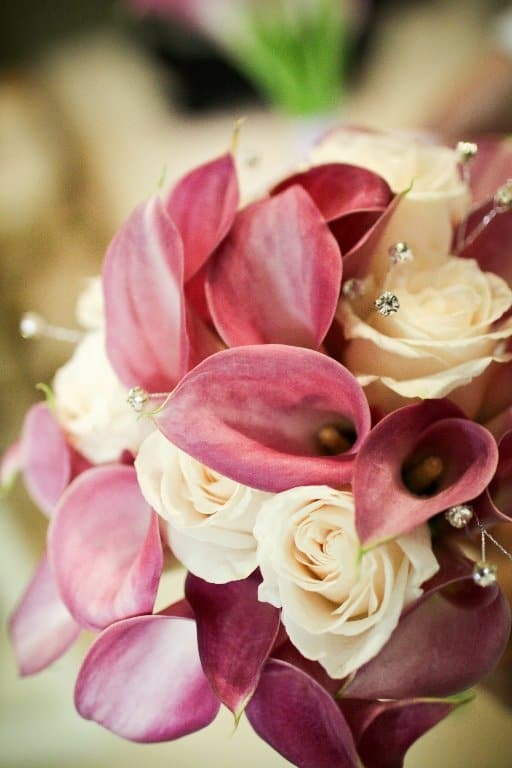 When the rep came back on the phone, she had found that they were out of mauve calla lilies and offered a FULL refund instead! So we used all 150 original flowers and thanked the Lord for providing all our gorgeous wedding flowers for free. By the way, the reviews for these flowers were raving saying that they lasted for up to 2 weeks after the event. Sure enough! Weeks after the wedding, Al’s boutonniere on our dresser looked as fresh as it did on our wedding day. *Last I checked, the price has gone up at Sam’s Club but they are still extremely inexpensive compared to most other florists. Costco now also sells mini calla lilies but in limited colors and more expensive than Sam’s Club. Although wedding favors can be a nice touch, we didn’t see the meaning or value in sending guests home with a fairly useless trinket that would likely end up in the trash. The cost and work in producing them was not worth it to us, so we skipped wedding favors altogether. Instead, we used our thank you photos with a handwritten note as a memento of the occasion and many of our friends still have them to this day. When we were planning for our wedding, a close friend of ours was commenting how she had lost touch with many of her bridesmaids and wasn’t as close to them as before. Her sage advice was, “Friends come and go, but your family will always be part of you.” I realized how true that was. 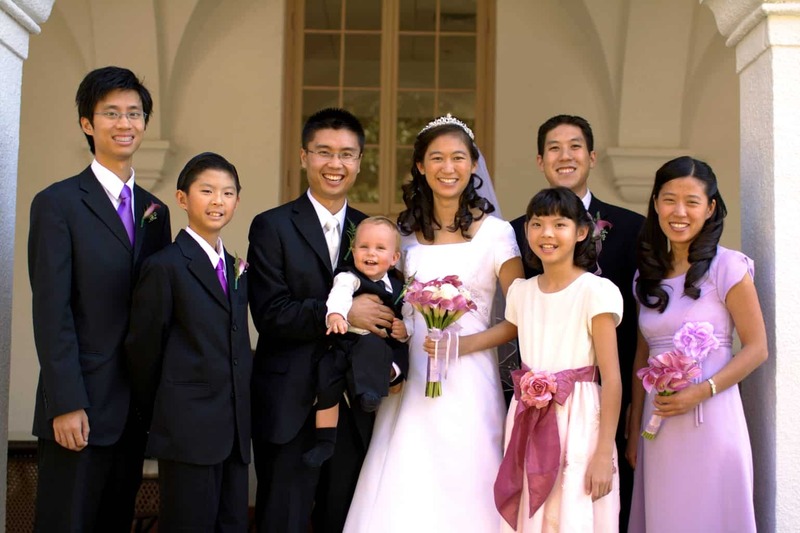 How many people do we know had a whole lineup of bridesmaids and groomsmen but now don’t know where they are and no longer keep in touch with them? But family are different, no matter the distance or life circumstances that separate you, you are always connected (like it or not!). So when we were making the hard decisions of who to have as our bridesmaids and groomsmen and also thinking creatively how to save money, we decided to have our siblings and cousins as our wedding attendants*. Sure, it was definitely a smaller wedding party, but those on the stage with us when we got married were those we love and will always be a part of our lives. And don’t forget, when you have a smaller wedding party (especially if they’re family) you have fewer outfits to worry about, fewer bouquets and boutonnieres to make (esp if you’re making your own like we did), they’re there anyway so you have fewer schedules to coordinate and accommodations to arrange (important for us because most of our family and friends were coming long distance), and of course, taking wedding party and family pictures is super efficient! * Oh, except for the cute little blond Bible boy. We made an exception for him! How many times have you attended a wedding, blew bubbles at the getaway, and found baskets and baskets of leftover bubble tubes sitting around the reception hall? Yeah, just about every wedding I’ve been to. That being said, it is very likely that many of your married friends have boxes filled with these leftover bubbles in their closets wishing they could get rid of them. So check with them before buying your own. Keep in mind that up to 50% of the guests have usually left by the time of the getaway, so don’t overestimate how many you’ll need. We used my brother and sister-in-law’s leftover bubbles and still had bubbles to spare! A sudsy getaway thanks to those who donated their leftover bubbles! These are just a few of the ways we saved money on our wedding, but there are millions more! What tips do you have to save money on the big day? Share your experience with us in the comments below! Can’t believe you used $332.50 for invitation only, that’s so cheap!My big day is next year July and I’ll definitely use your idea to invite my friends. Thanks for the great tips. So glad that some of the tips will be useful for your planning, Erastus! We were very happy with the invitations and everyone seemed to really liked them. Hope they work for you! Congratulations and blessings in your wedding planning! These are some great posts and worth considering. My wedding costs were about the $3000 range. My dad was laid off, my mom retired, and I never would have dreamed of asking them to pay for a wedding. It was a very small wedding, and not fancy by any means. Secondly, I got free invitations–all I paid was postage. I didn’t print any photos as part of the invitations or thank you notes. I bought my flowers at the grocery store. 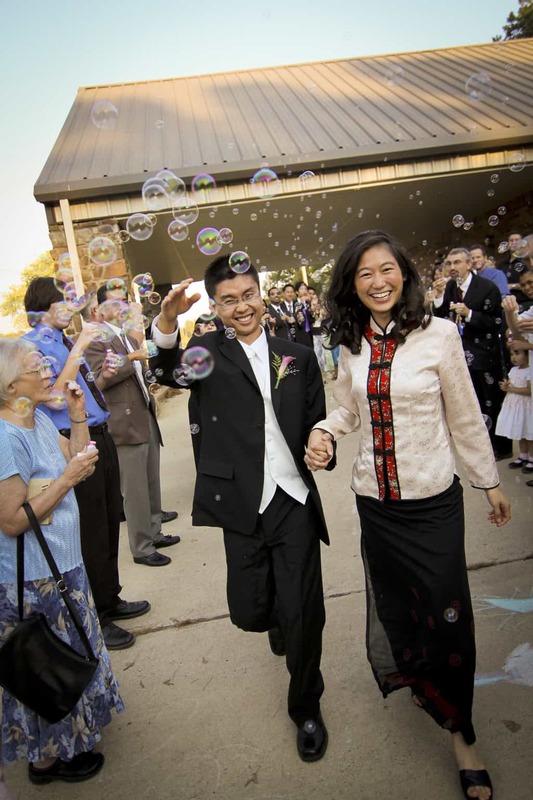 My dress was very simple–no train or veil, made of washable silk. That way, I was spared the $200 dry cleaning fee. Furthermore, I can alter the dress to wear again for another occasion. We had no attendants since it was so small–I didn’t want the fuss or expense. My flower girl wore a dress she had in her closet. I wanted people to wear things they would use again. I made some of the food along with a friend. My sister wore a dress that my mom had worn to another wedding over 20 years ago. The best part was that my husband got our free honeymoon plane tickets by being bumped 3 times at the airport. Looking back, I am glad we didn’t spend more than we did. Wow, sounds like you were really resourceful, Margaret! What a wonderful feeling to look back on your wedding and know you wouldn’t have changed a thing! Cosmos are so pretty! Glad they worked out even if you couldn’t use them for the bouquets. Definitely agree with you about the photography, too. I’ve been lurking around your blog (just discovered it!) and I really enjoy your guys’ writing! Very in-depth and solid advice, especially for young married couples (almost 2 years for me!). I very much agree on the no trinkets. We found we didn’t take them at any wedding we went to, or on the rare occasion we did, we ended up throwing them away. We decided we would make a donation to cancer research in honor of each guest. Money well spent! I also wanted to let you know we nominated you for a Liebster Award! We love this blog and thought a new and upcoming blog like yours could use some well deserved additional attention. It’s always great to meet other young couples on this journey to FI. Thanks for being a “lurker”! I just recently got married and we saved here and there on various things. THe photo invitation is certainly trendy lately, and luckily it’s cheap. We just printed and designed our own invitations. We DIYed most things and were able to keep our costs down. Hi Daisy! Congrats on marriage! 🙂 Yes, DIY really saves a lot. I just had to remember to prioritize and consider what I (and I’m friends and family!) could handle.